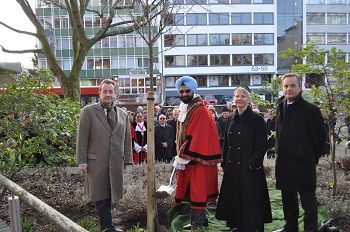 Pictured from left to right at the tree planting ceremony to mark Holocaust Memorial Day are Leader of Ealing Council, Councillor Julian Bell, Ealing’s Mayor, Councillor Kamaljit Dhindsa, Rabbi Janet Burden from Ealing Synagogue and chief executive Martin Smith. Children from four local schools were among those who joined a moving ceremony to mark Holocaust Memorial Day in Ealing on Monday, 27 January. Leader of Ealing Council, Councillor Julian Bell and Ealing’s Mayor, Councillor Kamaljit Dhindsa led the ceremony with Rabbi Janet Burden from Ealing Synagogue. Pupils from Hambrough, Beaconsfield, Tudor and North primary schools took part. Other attendees included Deputy Mayor of Ealing, Councillor Tej Ram Bagha, councillors, guests and members of the public.